Adapted from the 5-day classroom e-business course, this practical self-study course combines a boxset of six valuable books with access to cutting-edge e-learning. - You will be required to pay an additional exam invigilation fee direct to the ATP - Fees range from S75 - $250 depending on the centre. 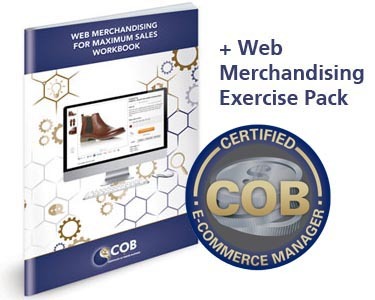 The COB Certified E-Commerce Manager Program replaces the E-Business Strategy, Planining and Management Learning wtih Powerful Web Merchandising training to maximise online sales. 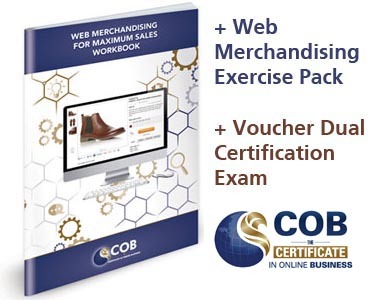 Includes the COB Certified E-Commerce Manager Extension Pack as detailed above, and the COB Certified E-Commerce + E-Business Manager Exam Voucher. Use voucher to book a special COB Certified E-Commerce and E-Business Manager Exam, at any of our Authorised Testing Centres. Exams at the British Council, Leading Professional Institutes and Universities around the globe. You will be required to pay an additional exam invigilation fee direct to the ATP - Fees range from $75 - $250 depending on the centre.